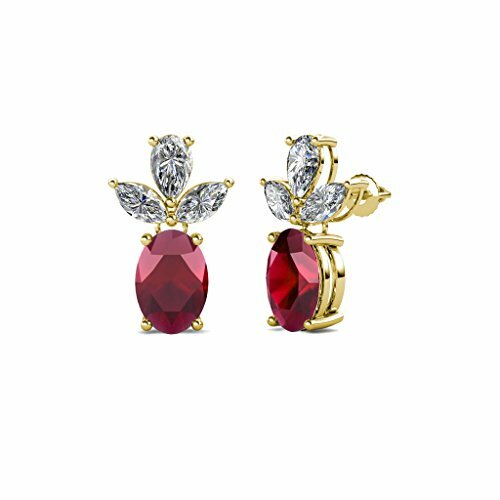 0.41 Carat tw Marquise and Pear Shape Diamond & 2.10 ct Oval Shape Ruby Dangling Stud Earrings in 14K Yellow Gold. These Dangling Stud Earrings has Marquise Shape Diamond of 3.5 mm x 3.9 mm, Pear Shape Diamond of 3.8 mm x 4.4 mm & Oval Shape Diamond of 7 mm x 5 mm. Gemstones may have been Treated to Improve their Appearance or Durability & may Require Special Care. Product is Smaller than what Appears in the Photo. It is Enlarged to Show Details. If you have any questions about this product by TriJewels, contact us by completing and submitting the form below. If you are looking for a specif part number, please include it with your message.